All About Jazz is celebrating Jimmy Blanton's birthday today! 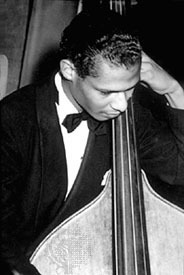 In his short tenure with Duke Ellington, Jimmy Blanton became the first great double bass virtuoso in jazz. Blanton had both the technique and the fine tone to take this style of playing to higher levels. Blanton took the bass, which had previously been used only to keep time and lay down a basic harmonic foundation, to a new dimension where it became an instrument capable of horn-like solos... Read more.